buggy and we went on over to Marys a little while. After I got supper over Will and I went up town to pick out a suit of clothes for Father. This is Chicago day at the fair. It will be a big day. Tuesday October 10th 1893 Will washed for me this morning though he did not feel well. I swept up stairs before dinner. In the afternoon I went up town awhile and ironed all the clothes. Mother was over most the afternoon. Fanny was here too. Hattie went to Waterloo to be gone all week. The papers report the attendance at the Chicago fair at over 700,000. It was an immense crowd. 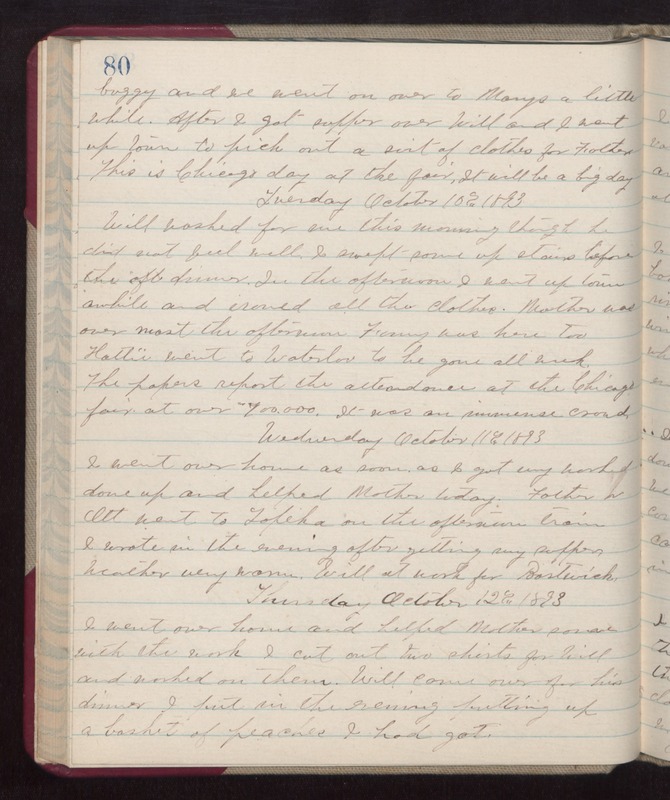 Wednesday October 11th 1893 I went over home as soon as I got my work done up and helped Mother today. Father & Ott went to Topeka on the afternoon train. I wrote in the evening after getting my supper. weather very warm. Will at work for Bostwick. Thursday October 12th 1893 I went over home and helped Mother some with the work. I cut out two shirts for Will and worked on them. Will came over for his dinner. I put in the evening putting up a basket of peaches I had got.